If you were listening to BBC Radio 2 on a Friday evening a decade ago you may have been forgiven in thinking you’d been transported back to the days of the Light Programme; a time before the Beatles, Elvis and the invention of rock ‘n’ roll. Thanks for the Memory celebrated a 78 rpm world; the era of the Great American Songbook, Al Bowlly stepping up to the microphone in front of Lew Stone’s Band. Of Tin Pan Alley, repertory theatre, concert parties and dining at the Café de Paris with Noel Coward. The nostalgia-monger was Hubert Gregg: broadcaster, composer, actor, director, producer and writer. Hubert was ideally suited to Thanks for the Memory. Not only did he have “a retentive memory” but, in many cases, he’d either met or seen the performer at the time, in a career that lasted over seventy years. In this post there’s a chance to hear once again some of those shows for “Wireless Two” as I canter through the Gregg radio broadcasting highlights that span from 1933 to 2004. Hubert Robert Harry Gregg was born in 1914 in Norfolk Road, Islington. Within the sound of Bow Bells, so his song Maybe It’s Because I’m a Londoner – “there’s a magic in the fog and rain” - is apt. The Gregg family hit on hard times and had an itinerant existence moving from town to town no less than fifteen times in eighteen years. But young Hubert was fascinated by the stage and screen, taking part in a talent contest – singing “Eat more fruit! Don’t eat mutton, don’t eat lamb.” – and watching the silent flicks. A scholarship to St Dunstan’s College secured his education and any spare time was spent watching variety acts at the local theatre or playing piano in the school dance band. His first stage appearance, in 1928, was an amateur production of If Four Walls Told. But Hubert’s real theatrical education came from an audacious act when he was just seventeen. After a Shakespeare performance at the Old Vic he hung around the stage door to collect his autographs and, summoning up courage asked of actor Robert Harris:” I hope you won’t think me mad but do you think it humanly possible for me to become a member of the Old Vic?” He didn’t join the company but he was introduced to Eric Earnshaw-Smith who became his mentor. Hubert went on to study at the Webber Douglas School of Singing and Dramatic Art and then, with encouragement from Roger Livesey, joined the Birmingham Rep. But the pull of live theatre proved too great and Hubert gave up his BBC staff job when he got a call to play in Hugh Miller’s revival of Johnson’s The Alchemist. It only ran for week but Hubert continued to work freelance for the corporation for the rest of his career. In 1937 Hubert got the opportunity to appear as Kit Neilan in a Broadway production of Rattigan’s French Without Tears. This American sojourn also gave him time to explore the latest musicals and entertainers on both coasts and he was fortunate to see the likes of Benny Goodman, Ella Fitzgerald, Cab Calloway, Tommy Dorsey and Fats Waller. Back in London the following year there was more radio work for the BBC as well as appearances on Radio Luxembourg as the announcer on Pond’s Serenade to Beauty (sponsored by Pond’s Cold Cream) featuring the music of Van Phillips and his Orchestra. Taking care not to alert the Corporation of his work for the commercial station – the programme was also transmitted by Radio Normandy - he used the pseudonym Michael Riley. Post-war Hubert would again work for Luxembourg, albeit indirectly, producing radio dramas on behalf of the Young and Rubicam advertising agency. But it was song-writing rather than broadcasting that gave Hubert his early fame. Although he wrote nearly 200 there are two which remain his legacy: I’m Going to Get Lit-Up and Maybe It’s Because I’m a Londoner. The first was a typical rousing wartime number, the idea coming to him after he was called up for duty as a private soldier and posted to Lincoln. On this particular morning we were discussing London. One lad had been on leave there and mentioned the severity of the blackout. They had eased the restrictions quite a bit so that there were fewer deaths from walking the dog but it was still a blackout and the bloody Hun had caused it – this was the tenor of the conversation. In happened to say “I’m going to get lit-up when the lights go up I can tell you!”. My lazy song-writing brain stirred and began to move into action. The song was not long in being made public, Hubert performed it at an All-Forces concert broadcast from Thornaby in Yorkshire just days later. The double meaning of the title appealed to the wartime sensibilities, though the BBC were initially reluctant to broadcast it. It was a couple of years later that it was finally published at a time when it was chosen by theatre impresario George Black for the show Strike a New Note. The song was assigned to a young South African singer named Zoe Gail. In time Zoe would become the first Mrs Gregg. Incidentally one of the earliest clips of Hubert in the BBC’s archive comes from a 1949 edition of In Town Tonight where roving reporter Brian Johnston spoke to the composer and introduced Miss Gail who belted out the song from the balcony of the Criterion Restaurant overlooking Piccadilly Circus. The occasion: the lights going on in London’s theatreland after going ‘dark’ days in the early days of the war. Maybe It’s Because I’m a Londoner was one of those songs composed in a trice, about twenty minutes as it happened, and then tucked away in a drawer and forgotten about. Two years later Jack Hylton was bringing the Crazy Gang back to London and wanted a song for Bud Flanagan. Out came the London song. Hylton was willing to pay one hundred for the exclusive stage rights but Hubert insisted on five pounds per week, terms that were grudgingly agreed. Together Again would run for four years but it all ended messily for Hubert when Hylton sued him for £1500. It transpired that “some comedian in Scunthorpe or somewhere had been singing [it] on stage”. Meanwhile, back in war-torn London, a chance meeting with actor Stephen Haggard led to more radio work, this time on programmes broadcast to the German Forces by the clandestine Political Wartime Executive. Haggard, who’d trained in Germany, was on the lookout for anyone with microphone experience and at least a grasp of the German language. Hubert was not fluent but “with a little practice I would rattle off seven or eight minutes of scripted German in such a way that a Hun would be hard put to it to see through the ruse.” During his time with the PWE, working on the programme Sending for die Deutsche Wehermacht, he was roped in the supplement the cast of the film In Which We Serve, his first credited film role. There’s one literary work that runs like a thread throughout Hubert’s career and that’s Jerome K. Jerome’s much-dramatised comic novel Three Men in a Boat. Hubert recalls how when asked to appear on the Light Programme’s Saturday Night On the Light (“a radio kaleidoscope of words and music”) he chose to read extracts from the book. Apparently “the reception was phenomenal.” So much so that he was immediately invited to ‘Jerome’ on Henry Hall’s Guest Night and then Hall’s television show Face the Music. For this performance he chose to wear a bowler hat and, as a result, was offered the film role of the bowler-hatted Mr Pusey, duped by the wily crew of the Clyde puffer, in the Ealing comedy The Maggie. Two years later he was back in the film studios, this time at Shepperton , for the filming of Three Men in a Boat, with a script by Hubert and Vernon Harris. Recognising a good thing when he found it he added music and lyrics for a musical version of the tale broadcast on the Light Programme at Christmas 1962 with Kenneth Horne as Harris, Leslie Philips as George, Hubert as J and Percy Edwards barking Montmorency the dog. In fact it was Hubert’s second appearance in a radio adaptation; the first some 18 years earlier in a 1944 version with Basil Radford and Naunton Wayne, better known to radio and film audiences as that cricket-loving duo Charters and Caldicott. Surprisingly Hubert did very little regular television work. In his obituaries only two shows are mentioned, both from the 1950s. For the BBC there was the chairmanship of TV Brains Trust though there’s nothing to suggest it was anything other than a handful of appearances as the question master. Similarly over on ITV in 1957 he popped up as chairman of a few editions of Granada’s Youth Wants to Know. The TV Times billed this as “each week Granada invites to their TV centre in Manchester two celebrities who are experts on a particular subject, but who have opposing views. They will face a barrage of questions from a group of Northern young people”. Hubert chaired some of these shows between February and March, with the 10 April edition looking at “The H Bomb”, a matter far removed from the world of theatre. (Others in the chair that year were Leonard ‘The Good Old Days’ Sachs and Elaine Grand, later of Thames TV’s Afternoon Plus). Hubert first started to mine the vein of nostalgia in 1964 with his radio show A Square Deal: “a round of yesterday’s records for the squares of today”. “At the time”, he recalled in his autobiography, “there seemed to be nothing but pop music blaring out of radio sets and I wondered how the millions who, like me, didn’t care for cacophony, were managing.” The programme, initially going out on the Home Service but transferring, a couple of months later, to the Light, was seen by one critic as “a recuperative refuge” with the delights of “the Andrews Sisters, Roy Fox, Al Bowlly, Nat Gonella, Jack Hulbert and Bobby Howes”. A Square Deal, now on Radio 2, ended in December 1967 but Hubert was back in the summer of 1968, this time on Radio 4, with a weekly afternoon show I Remember It Well. Running for twelve weeks each edition would also ask a well-known entertainer or actor to choose records that had particular memories for them, they included Kenneth More, John Hanson, Danny Le Rue, Adam Faith, Kay Hammond, John Clements and, in the final programme his second wife, Pat Kirkwood. It’s often overlooked that Hubert’s most popular and long-running show, Thanks for the Memory, wasn’t originally presented by him. It had started on Radio 2 in October 1969 with Gale Pedrick, the picker on Pick of the Week, in the chair. When Pedrick died the following February producer Sheila Anderson approached Hubert to take over the reins, so starting a 44 year run. A few tweaks were made to the Thanks for the Memory format over the years. Out went the Victorian memories and archive snippets, out went the theme – Beethoven’s Sonatina in C major for Mandolin and Piano – and in came his old A Square Deal theme Time Was by Nelson Riddle. And in, of course, came Hubert himself singing a tune accompanied at the piano by Gordon Langford. Over time too the scripts became more stylised: the show was broadcast on “Wireless Two” and would be back in “a sennight”. Eventually settling into a Friday night slot, though for many years it darted around the schedule, it became “the Friday night club” with Hubert “in the square chair” often with “jaggers and taggers” to hand. Though it sounded impromptu… those pauses … were all scripted … the page full of dots and dashes. Hubert claimed that one of the positive effects of Thanks for the Memory was on record companies. 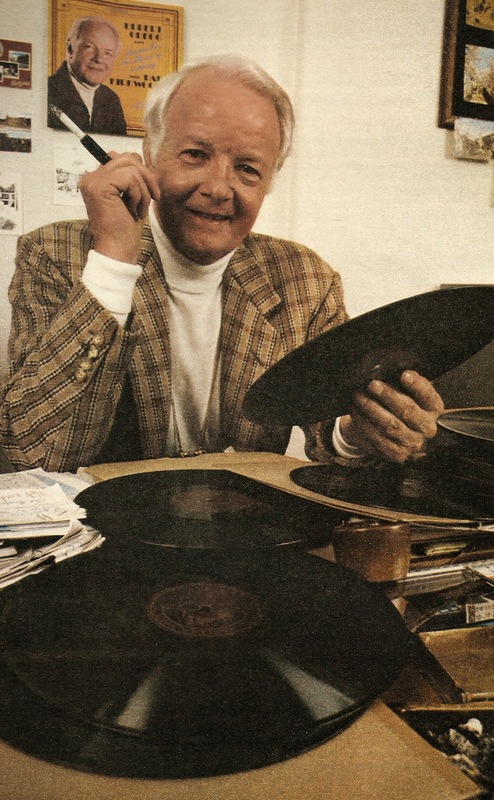 In 1978 he told the Radio Times: When it started, very little vintage material was available on record. Two years of steady nagging at the record people finally convinced them there was a public for their old stuff; now you can find whole racks of wonderful re-issues”. 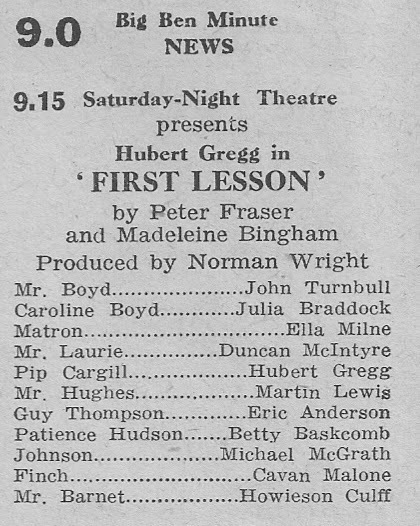 Such was the success of Thanks for the Memory that Hubert was invited to present other programmes on the network such as the 40-part Hubert Gregg at the London Theatre (broadcast January to October in 1974) and five series of what he termed “a personal spotlight on special people in entertainment” titled I Call It Genius and I Call It Style. The subjects of these programmes were people whose work Hubert adored:“I have seen and heard them play, sung their songs … watched them dance ---in some cases talked and imbibed with them into small hours made great by conversation”. Indeed it was with Jack Buchanan that Hubert imbibed, on gin and tonic, when he was working with the entertainer in the mid-50s. Jack had been a childhood hero of Hubert’s – he’d queued outside the stage door to collect his autograph. 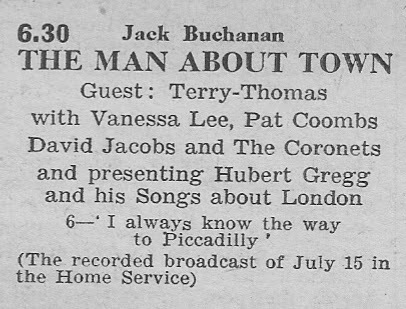 Thirty years later he was asked by Jack to provide a weekly song about London – If I Could Take My Pick I’d Pick Piccadilly and so on - as well as the title song for the 1955 Home Service series The Man About Town. From the third series of I Call It Style comes this appreciation of songwriter Harry Warren. In his later years Hubert remained busy, still broadcasting, writing and, together with his third wife Carmel (they’d married in 1980), studying for an Open University degree. The final edition of Thanks for the Memory was broadcast on 5 March 2004. Sadly just weeks later, ten years ago today, he passed away. On 20 April 2004 David Jacobs presented Radio 2’s tribute to Hubert. This programme includes excerpts from Man About Town, Three Men in a Boat and, of course, Thanks for the Memory. 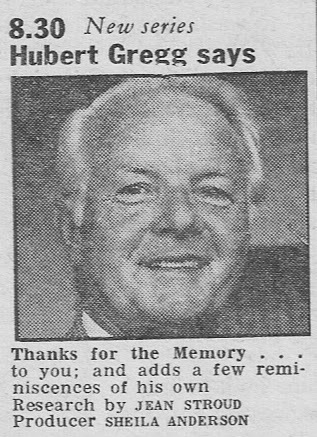 Hubert Gregg 1914-2004 Au revoir … to you. With thanks to Carmel Gregg and Paul Langford. During the 1930s Hubert made somewhere in the region of 400-500 broadcasts. My research has uncovered details of just under 40 of them showing the range of his work and the many stars (or stars in the making) he worked alongside. 5 July 1934 Beauty and the Jacobin by Booth Tarkington with Pascoe Thornton, Barbara Couper, Hubert Gregg, Rosalinde Fuller, Leslie Perrins, Norman Shelley and Eric Anderson. 19 May 1936 London Wall by John van Druten “Mr Hubert Gregg gave a very plausible sketch of a tiresome, inarticulate and good young man”. 17 February 1937 Children’s Hour with the play Tales of Western Hope by Sybil Clarke. Now and Then was first broadcast on 10 May 1968 when the presenter was Alan Dell. Other presenters in addition to Hubert were Jimmy Hanley, Henry Hall, Sam Costa, Peter Brough, Joan Turner, Ted Ray, George Elrick and Brian Rix. The final edition aired on 26 September 1969. Thanks for the Memory with Gale Pedrick was first broadcast on 3 October 1969 with Hubert taking over the following March, though I don’t have the exact date for this one. A number of online sources incorrectly state that the programme ran from 1972. I Call It Genius was broadcast over two series in 1980 and 1981 with out of sequence repeats sometime combined with editions from I Call It Style until 1985. The working title had been A Touch of Genius but during the show’s preparation that title was used elsewhere on the radio, in fact by Robin Ray over on Radio 4. I Call It Style was broadcast over three series between 1981 and 1985 with out of sequence repeats into 1986. I’m not 100% certain about the running order for weeks four to six of the second series as the industrial action prevented the printing of the Radio Times. Fifty years ago today the sound of British radio changed forever with the launch of Radio Caroline. It was the start of a brief three year starburst of offshore radio activity. Derring-do on the high seas, an explosion of British pop music, swinging jingles and flouting the law. For those broadcasting and listening it was an exciting time. Pirate radio kick-started the careers of dozens of DJs who’d go on to work for Auntie Beeb or the early ILR stations, and a fair few TV continuity announcers too. The mid-Atlantic style was heavily influenced by aping Stateside DJs (not to mention a great deal of Australian and Canadian input), liberal use of PAMS jingles, self-op desks and strip programming all set the template when Radio 1 hit the airwaves in late 1967. Caroline wasn’t the first offshore pirate station, there’d been Scandinavian and Dutch based offerings such as Radio Mercur, Radio Nord and Radio Veronica. But Caroline made history as the first station to offer an English service with live shows from the ship, trumping rivals Radio Atlanta on air by 46 days. 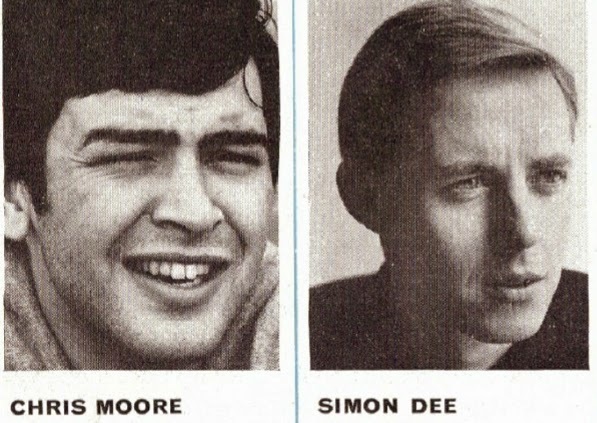 The first voice on Radio Caroline that Saturday back in 1964 was Simon Dee – “this is Radio Caroline on 199, your all-day music station” – though technically he was beaten to it, if you count the test transmissions they made on Good Friday, by a taped show from John Junkin. The comedy writer and one third of Hello Cheeky was briefly a Caroline DJ recording shows in London with the tapes being shipped out to the station for later broadcast. But listening back to the airchecks of the fledgling Caroline service you’d be hard pressed to spot the difference between it and the BBC Light Programme, punctuating the pop tunes are orchestral pieces, easy listening classics, show tunes and jazz. The pace was slow, subdued almost, there was no chat just straight announcements and, for the first month, no commercials (the first main ad being for Bulova watches, “when you know what makes a watch tick you’ll buy a Bulova”). But the attraction of an all-music station proved an immediate success: over 20,000 letters were received at Caroline’s London offices during the first fortnight and the audience was estimated at seven million. For those that remember the 60s pirates the reason they tuned in was to hear pop music no matter what the time of day. The BBC was hidebound by needle-time restrictions and MU agreements. But what, exactly, did the BBC offer when Caroline launched? Checking the Easter issue of the Radio Times (and the listings for the Light Programme) offers some clues, though, of course, I’ve no idea as to what records they did or didn’t play. On the Saturday it was light music all the way until 9 a.m. when it was time for Children’s Favourite’s. Perhaps guest presenter, Blue Peter’s Christopher Trace, played some pop along with Nellie the Elephant? There was guaranteed pop at 10 a.m. with two hours of Saturday Club. Brian Matthews guests were Cliff and the Shadows, Mark Wynter, The Hollies and Kenny Ball. Brain also popped up on Sunday morning with Easy Beat featuring Adam Faith, The Bachelors, The Caravelles and, no doubt providing some cover versions, the Johnny Howard Band. At the moment that Caroline launched the Light Programme had Exhibition Choice, one of those occasional shows that used to come from either the Ideal Home Exhibition or the Radio Show, this one was hosted by John Ellison. Mixing records and comedy clips at lunchtime was Jack Jackson’s Record Roundabout and in between the sport Three’s Company with the Polka Dots and The Searchers. There was pop of the European variety at 6.30 p.m. as Katie Boyle hosted Pop Over Europe. Meanwhile on Easter Sunday there’ll no doubt have been a handful of current tunes amongst the record requests on the most listened to show on radio at that time, Two-Way Family Favourites, which regularly pulled in 18 million listeners. The only guaranteed 100% pop record show was Pick of the Pops with Fluff, back then running at just an hour between 4 and 5 p.m. , with that week’s chart seeing Can’t Buy Me Love entering at number one. And that was it as far as the weekend was concerned. During the week how about Parade of the Pops (Bob Miller and the Millermen with guests Craig Douglas and Jan Burnette) or The Joe Loss Pop Show (with vocals from Ross McManus and guests Billy J Kramer and the Dakotas). Other than that you could take pot luck on Housewives’ Choice or Twelve O’Clock Spin. In 2009 Johnnie Walker recreated the sounds of the pirate era (though the pretence of broadcasting from onboard ship wore thin after a time) on Radio 2’s Pirate Johnnie Walker series. In this first clip the guest DJ is Emperor Rosko. Working on both Caroline and London was Ed Stewart. On both the South and North ships was Dave Lee Travis. From the final programme from 27 December 2009 is Dave Cash who joined Radio London within days of its launch in December 1964. There’s also a tribute to Mike Ahern who died a couple of months earlier. This series is currently getting overnight repeats on BBC 6 Music. BBC Radio 2 has a 2-part documentary about the offshore pirates that airs next month (I don’t have full details at the time of writing). On Easter Monday BBC Radio Norfolk has a full day of celebrations and are wheeling out DJs that were associated with the pirate stations: Ray Clark, Andy Archer, Tom Edwards, Keith Skues and Colin Berry. BBC Radio 5 Live celebrates twenty years on air this week with the return of Jane Garvey, who launched the station on 28 March 1994, and a week of ‘presenter swaps’ for Peter Allen who was also there at the start. The station focussed on news and sport 24-hours a day; the comedy, music, education and children’s shows of the old Radio 5 were cast to the four winds. Opening proceedings at 5 a.m. was Jane Garvey with Morning Reports, the programme remains a 5 Live fixture to this day. Looking after The Breakfast Programme was 5 Live’s kingpin Peter Allen, one of only three voices heard that day that have lasted the full twenty years. Poached from Today was Diana Madill to present The Magazine from 8.35 a.m. to midday. As well as a phone-in there were daily features on the environment, health, conservation, science and film and video reviews. Rising star Eddie Mair presented the two-hour Midday with Mair, at the time still presenting Radio 4’s Saturday morning travel show Breakaway. Mair’s show included a daily Moneycheck with Liz Barclay, later of You and Yours. From Radio 1’s Newsbeat and, at the time the new BBC1 current affairs show Here and Now, came Sybil Ruscoe with Ruscoe on Five between 2 and 4 p.m. The only daytime presenter to come over from the old Radio 5 was John Inverdale with the imaginatively titled John Inverdale Nationwide. ‘Invers’ still works for the network, most recently hosting the Cheltenham Festival coverage. At 7 p.m. each day was News Extra followed most evenings by sports coverage. On the launch day it was Pat Murphy’s series Good for a Quote starting with the career of Tommy Docherty and then Jon Champion with Champion Sport featuring commentary on the Sheffield United/ West Ham match. In week one there was also Football Plus with Jonathan Legard and Trevor Brooking’s Football Night. Friday night’s, from week two, saw Parky back on the radio with Parkinson on Sport. News Talk at 10 p.m. was an hour-long discussion of different aspects of news and current affairs themed each evening. On Monday there was the BBC’s Social Affairs Correspondent Niall Dickson. On Tuesday Paul Reynolds had a kind of From Our Own Correspondent. Wednesday was Nigel Cassidy on matters financial and Thursday all things political with John Sergeant. Friday nights were a little different with a 30 minute review of the newspaper business, Stop Press, usually presented by John Diamond, followed by Financial Week with Heather Peyton, who had previously worked on Radio 4’s The Financial World Tonight. Between 11 p.m. and midnight a round-up of news, sport and business in Night Extra followed by The Other Side of Midnight with Tim Grundy. On other evenings you'd hear After Hours, a live talk show “where nothing is taboo”, though no host is listed, can anyone remember who it was? Meanwhile on Thursday night Stuart Cosgrove’s talk show was Night Moves. Rounding off the day, between 2 and 5 a.m., another stalwart of the station’s schedules Up All Night with Rhod Sharpe, the third of the voices still on air today. The weekend presenter was former-LBC man Richard Dallyn. And finally honorary mention must go to Adrian Chiles. He‘d also worked on The Financial World Tonight and joined Radio 5 Live as the business reporter in Wake Up to Money, which then was part of Morning Reports, and so was heard on day one. Of course he went off to do his TV work for the Beeb and ITV but returned to the station last year as co-host Friday’s 5 Live Drive. Its origins lie in the Light Programme show What Do You Know?, billed as “a programme of problems and brain-teasers devised for your entertainment”, first broadcast in 1953. Devised by John P. Wynn and chaired by Franklin Engelmann it was originally in two parts: Beat the Experts and Ask Me Another, which was the quiz played between contestants “representing all parts of the British Isles”. In the first programme the panel of experts were Dilys Powell, Ivor Brown and Christopher Cummings. 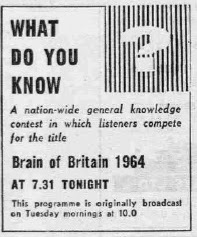 Ask Me Another was spun-off as a TV series in 1958 – also chaired by Engelmann and making resident expert Ted Moult a household name - and it was this quiz element for which, by the late 1950s, contestants would compete for the title of Brain of Britain, the prize at that time being a diploma. For the 1968 series What Do You Know? became Brain of Britain, the new title “seems to be more indicative of the contest” explained producer Joan Clark. 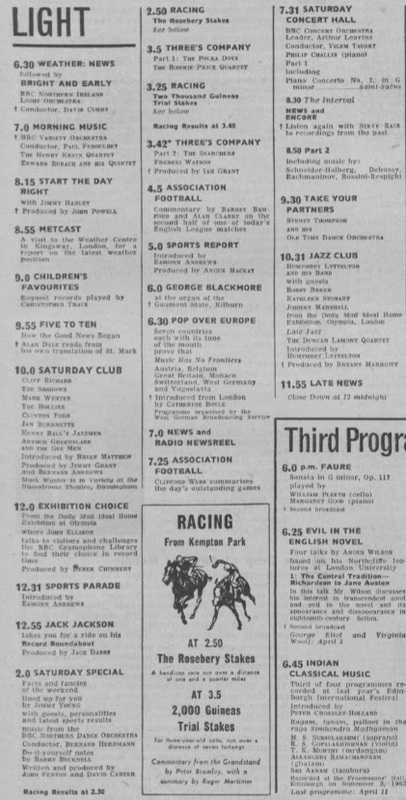 The programme remained unchanged until the death of Engelmann in 1972 and Robert Robinson took over as chairman – not sure if this was part way through the 1972 series or not. It’s Mr Robinson who is now most closely associated with the show and this recording comes from the 1980 series, complete with the souped-up Waldo de los Rios version of the theme tune. (Previously posted under Radio Lives – RobertRobinson). Robinson would always refer to the quiz as ‘Brian’. “When I receive BBC communications about it the first word is often mis-typed as ‘Brian’, he told the Radio Times in 1985. “Thinking of it as Brian of Britain is like recalling an old friend. The shedding of miscellaneous information is what I do best. I’m not sure whether it’s a gift or an affliction.” His final edition aired on 19 January 2009, and he died a little over two years later. The final of the current series chaired by Russell Davies is on Radio 4 next Monday afternoon. What Do You Know? 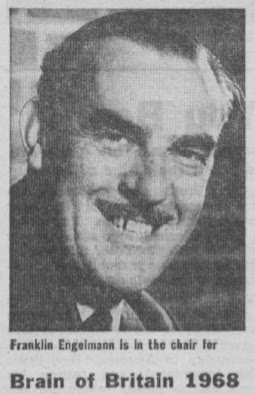 ran from Sunday 2 August 1953 to Sunday 16 July 1967 on the BBC Light Programme. The Grand Finale was on 2 July followed by two special challenge matches in which the three finalists played against teams from The World at One and Any Questions. Brain of Britain started on Radio 2 on Sunday 14 January 1968. It moved across to Radio 4 for the 1970 series beginning on 3 January 1970.